I’m a true California girl and take pride in being from what I think is the most beautiful state in the country. We have everything: the mountains, a beach you can actually swim in, fabulous restaurants, delicious wine, and fantastic shopping all at our finger tips! What I enjoy most about living in this little slice of heaven I call home is that 9 times out of 10 the sun is shining! Even in what is called spring we will have 80+ degree weather, BEAUTIFUL! This constant sunshine typically means that berry and squash season come a little earlier for us Californians. 🙂 YAY! 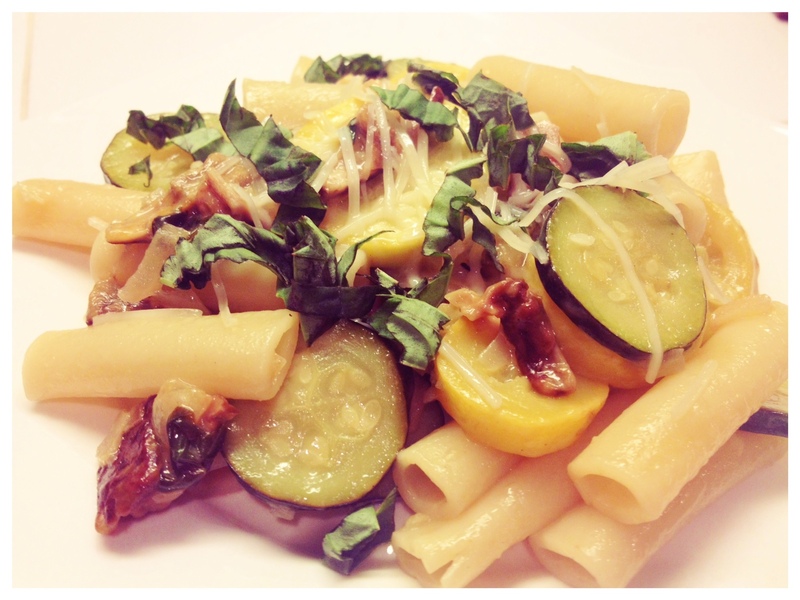 One of my favorite squash recipes is my Summer Squash pasta! It features both zucchini and yellow squash along with mushrooms and garlic. It is gently coated with extra virgin olive oil, crisp white wine, and topped with basil! DELISH! Add white wine and the remaining olive oil cook for 5 minutes, stir occasionally.